MEMBERS of the Zimbabwe National Liberation War Veterans’ Association (ZNLWVA) have cried foul over their alleged marginalisation by President Emmerson Mnangagwa’s administration. ZNLWVA spokesperson Douglas Mahiya told NewsDay yesterday that the former fighters were not happy that after bearing the brunt of former President Robert Mugabe’s regime last rites, Mnangagwa seemed to have forgotten about them hardly seven months into office. 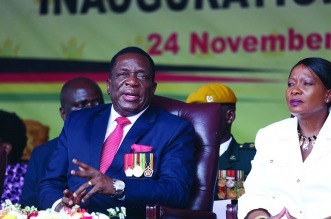 Mahiya said the war veterans had expected better from Mnangagwa, whom they defended with their skin, as Mugabe’s hangers-on bayed for their blood. “The ZNLWVA has noted with serious concern that hardly less than six months, the nation has forgotten the brave and unwavering battles against Mugabe and his wife (former First Lady) Grace’s [Mugabe] endeavour and restless desire to establish a dynasty,” he said. Led by Mnangagwa’s chief adviser Christopher Mutsvangwa, the former fighters fought the Zanu PF faction known as G40, reportedly Mugabe’s brainchild. ZNLWVA leading figures were arrested and charged, kicked out of Zanu PF, but shot back by publicly declaring their allegiance to Mnangagwa, then Vice-President of the country, before he was sacked in early November. The sacking triggered a chain of events that culminated in the military intervention that forced Mugabe’s dramatic resignation after thousands of people rallied across the country led by the war veterans demanding he goes. “The show is being stolen away from the war veterans, the newspaper reportage excludes the revolutionary spirit the war freedom fighters demonstrated to keep the revolutionary fire burning, on course and firm, although not much has yet come their way. Those who were idling, bootlicking, hiding in trenches got promoted at the expense of the war veterans and the masses,” Mahiya said. The war veterans’ spokesperson said Zanu PF had been “invaded by unprogressive forces. The evil nature of these forces must continue to be unmasked”.